Workers and students held street protests, some of them violent, across France yesterday, while train drivers, teachers and others went on strike to reject a government reform relaxing the 35-hour limit on the working week and other labour rules. Student organisations and seven unions had called for the protests to reject the Socialist government's bill, which they argue will badly damage hard-won worker protections. The government and businesses claim that the reforms will make it easier for companies to hire people - but they will also make it easier to lay off workers. France's unemployment rate is hovering around 10pc. Earlier in the day, a few dozen protesters, who were mostly hooded or wearing masks, broke off from a peaceful student demonstration in eastern Paris to hurl paint bombs at banks and stores. Some smashed cash machines with bats or set off smoke canisters while confronting the police. 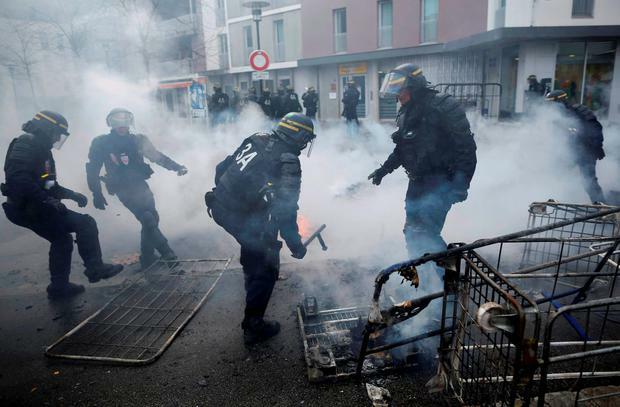 Clashes also broke out between a small group of young protesters and the police in the western cities of Nantes and Rennes. The bill is to be debated in parliament this month.